Coordonnateurs : Dakin John P., Brown Robert G. W.
Handbook of Optoelectronics offers a self-contained reference from the basic science and light sources to devices and modern applications across the entire spectrum of disciplines utilizing optoelectronic technologies. This second edition gives a complete update of the original work with a focus on systems and applications. 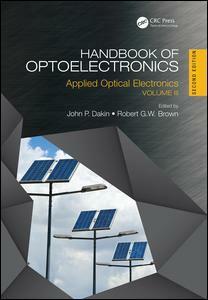 Volume I covers the details of optoelectronic devices and techniques including semiconductor lasers, optical detectors and receivers, optical fiber devices, modulators, amplifiers, integrated optics, LEDs, and engineered optical materials with brand new chapters on silicon photonics, nanophotonics, and graphene optoelectronics. Volume II addresses the underlying system technologies enabling state-of-the-art communications, imaging, displays, sensing, data processing, energy conversion, and actuation. Volume III is brand new to this edition, focusing on applications in infrastructure, transport, security, surveillance, environmental monitoring, military, industrial, oil and gas, energy generation and distribution, medicine, and free space. No other resource in the field comes close to its breadth and depth, with contributions from leading industrial and academic institutions around the world. Whether used as a reference, research tool, or broad-based introduction to the field, the Handbookoffers everything you need to get started. John P. Dakin, PhD, is professor (emeritus) at the Optoelectronics Research Centre, University of Southampton, UK. Robert G. W. Brown, PhD, is chief executive officer of the American Institute of Physics and an adjunct full professor in the Beckman Laser Institute and Medical Clinic at the University of California, Irvine.